I’m Bryden Sweeney-Taylor, one of the Core Team members at Outer Coast. I was a student at Deep Springs from 1998 to 2000 and graduated from Harvard with a degree in Folklore and Mythology. Over the last dozen years, I’ve worked in non-profit education ventures, and I’m currently CEO of College Access and Success at America Achieves. I first learned about Outer Coast in the spring of 2015 while I was teaching at Deep Springs and Will Hunt, Outer Coast Winter Fellow and Core Team member, was finishing up his second year at Deep Springs. I met Jonathan Kreiss-Tomkins later that summer, and my involvement in the project expanded throughout the 2015-2016 academic year. In the fall of 2016, I became a Core Team member. Deep Springs College has been one of the inspirations for our work on Outer Coast from the get-go. 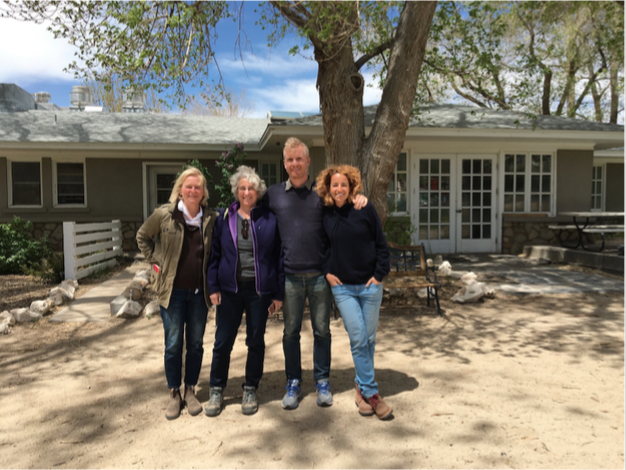 So earlier this spring, fellow Core Team member Sara Feinberg and I rendezvoused with Mollie Kabler and Marya Pillifant, who serve on the Sitka Fine Arts Camp (SFAC) Board of Directors, for a visit to Deep Springs Valley in Eastern California. SFAC is the owner of the Sheldon Jackson Campus, the prospective home of Outer Coast, and the Board was eager to get a better sense of what Deep Springs is all about as part of their due diligence process to understand how Outer Coast could be integrated into the existing programs at Sheldon Jackson. Mollie and Marya came down all the way from Alaska — Sitka and Anchorage, respectively — to Las Vegas before heading north to Deep Springs. We arrived on a glorious Sunday afternoon that marked the start of the last week of Deep Springs’ spring term. Our first adventure had us heading south from the Main Circle of campus on a dusty dirt road, past the Dairy, Fields 5, 6, 7, and 8, the Metal Dump and the Dead Animal Dump, to the shores of Deep Springs Lake to catch a glimpse of the endemic Deep Springs Black Toad. We saw more than a few! Sara Feinberg, Mollie Kabler, and Bryden Sweeney-Taylor among the toads at Deep Springs Lake. Back at the College we were greeted by a dinner cornucopia prepared as a final project by students in the Chemistry of Food and Agricultural Systems classes, including our fair share of ancient grains and a number of tasty horchata variations. Later that evening we enjoyed a DSPAC (Deep Springs Performing Arts Committee) musical performance from students, faculty, and staff — and staff children — alike. While in the Valley, we were able to sit in on a few classes, including Professor Jennifer Smith’s Constitutional Law, Dean Amity Wilczek’s Agricultural Systems, and Professor David McNeil’s St. Augustine, as well as join a meeting of the student-led Applications Committee, which had just finished accepting the incoming class. Sara milking Vera in the Dairy. 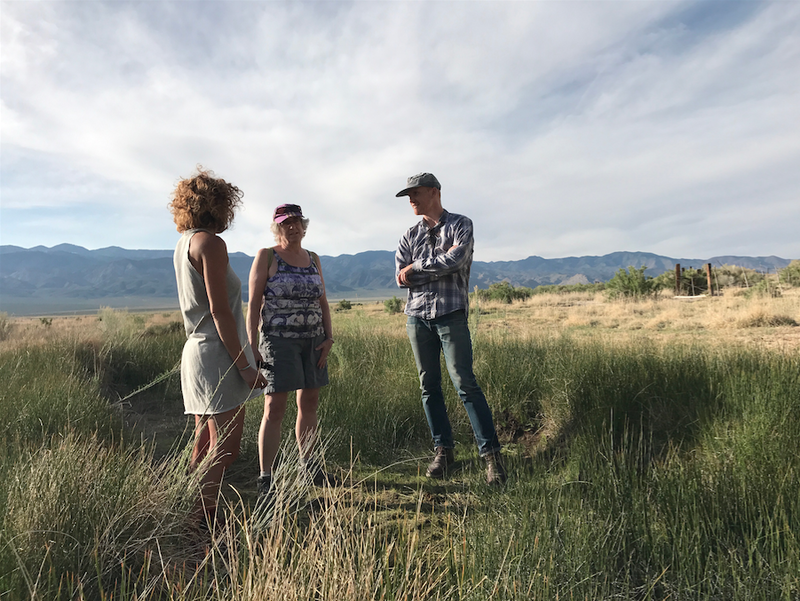 On Tuesday, our last day in the Valley, Mollie and Marya met with Deep Springs President David Neidorf to discuss their impressions of the College and hear David’s perspective on the prospects of Outer Coast and a potential partnership with SFAC on the Sheldon Jackson Campus. We are incredibly grateful to the entire Deep Springs community for making an exception to the visitor policy (which limits the number of guests during the academic term) in welcoming us. There seems to be a lot of enthusiasm among the community for the idea of Outer Coast and support for our making this vision a reality. And special thanks to Mollie and Marya for making the long trip down to the Lower 48 to move us one step closer to realizing the promise of Outer Coast in Sitka. Marya, Mollie, Bryden, and Sara in front of the Boarding House. We’re hoping that this is just the first of a few trips to come as we continue our work! We’re thrilled to be able to share an update on our visit and our progress and build on your contributions as we forge ahead. We thought you’d love to get a flavor of the energy that fills Sitka — and in this instance the second annual Sitka Arts & Science Festival, which runs July 22 through August 4 of this year. Curious about Outer Coast? Curious about the Outer Coast? Curious about Sitka? Come! We’d love to show you around. You can sponge up Sitka’s amazing energy alongside music, lectures, and more. Sitka Fine Arts Camp and Sitka Sound Science Center do a great job hosting and organizing the festival.